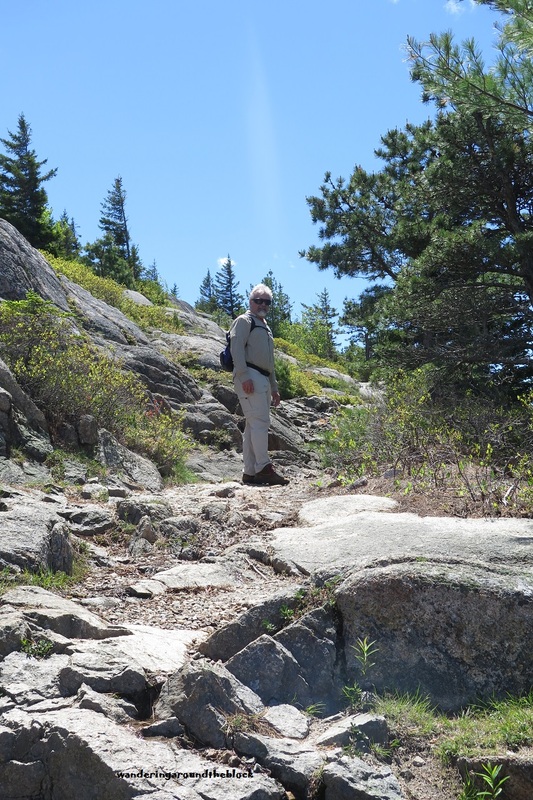 A few days after hiking Beech Mountain in Acadia National Park, I found myself heading up to Mount Desert Island once more to make use of the 7 day visitor pass (the park does not issue day passes). I had offered my unexpired visitor pass to a co-worker and she mentioned that we should attempt the Gorge Trail on our next day off. 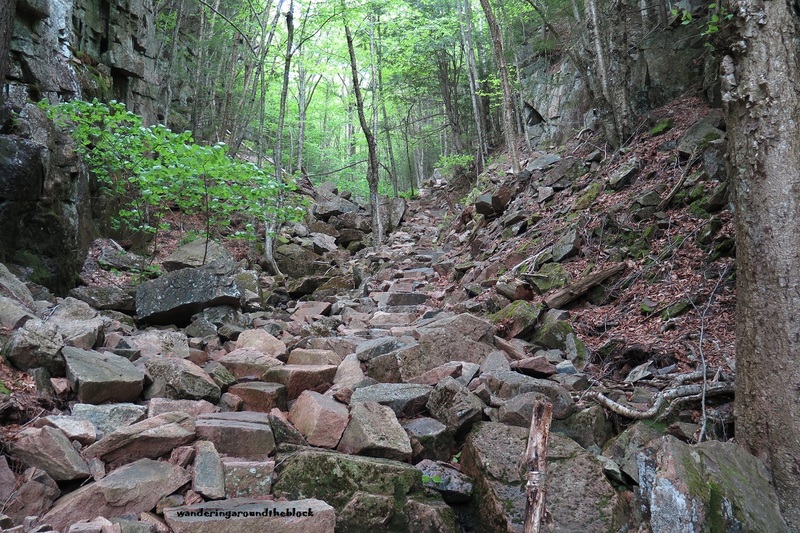 When I researched this trail, which heads up Cadillac Mountain, I found descriptions such as, “dogs are permitted on this trail though the upper section of the Gorge Trail is too steep and dangerous for many dogs”, or after reaching the top of the gorge there was still “500 feet to rise in only four tenths of a mile” . Huh? At this point I turned to my friend at said, “are you out of your mind! 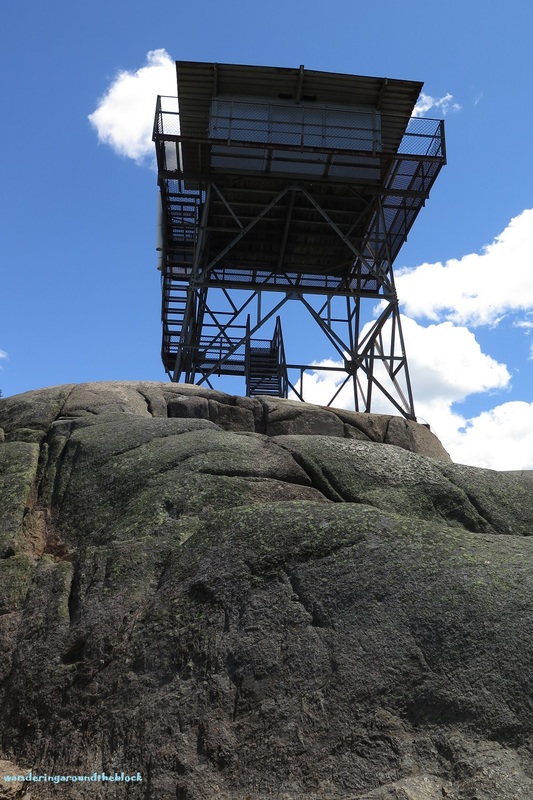 ?” She swore that she was not interested in reaching the summit of Cadillac Mountain, she only wanted to reach the top of the stone steps and turn around. Given this assurance I agreed to attempt the hike. 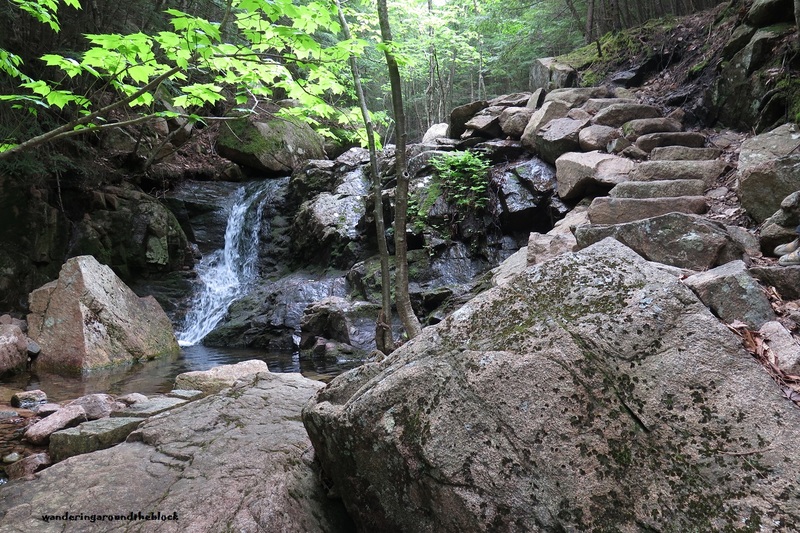 Once at the trail-head, we descended a set of stairs towards Kebo Brook. 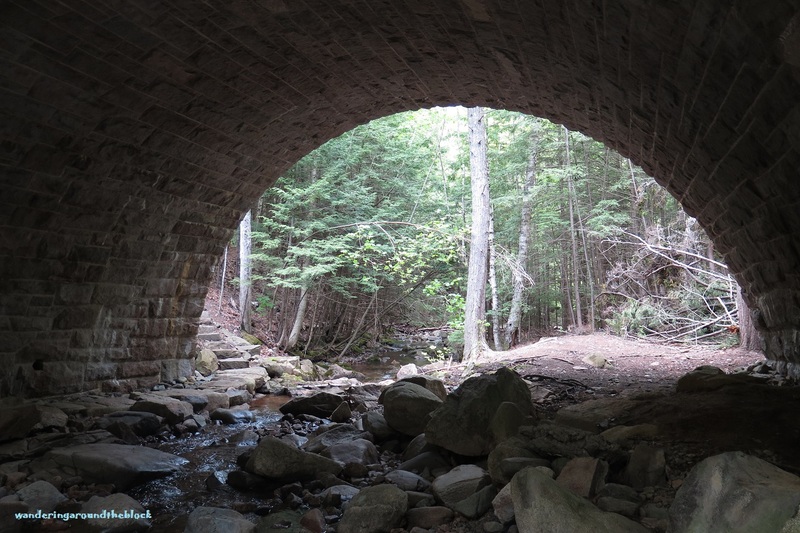 We paused a few minutes to study the brook and the stone bridge spanning the flowing water. It was here that I realized I had found my new hiking partner; a kindred spirit who also wanted to take the time to meditate on her surroundings and photograph her observations. After ascending a short series of steps on the opposite side of the brook, we continued on our adventures through a dark forest, crossing a bog bridge along the way. It wasn’t long before the terrain began to take on a rocky appearance and we were climbing alongside a stream. We stopped many times along the way to study the granite walls around us, wondering who lived in the cave-like holes carved in the stone. We also took delight in the numerous waterfalls along the trail. We certainly had amble opportunity to admire those waterfalls since the trail crossed the water many times. Near the top of our climb, we found the most beautiful cascade of our hike. With water rushing over the rocks, stairs ascending nearby and the surrounding greenery, we had truly found the spirit of nature. We certainly spent a bit of time meditating on the view. At this point I was in the lead and, as a looked ahead I noticed that the trail was becoming more vertical. The flat stones used to pave the path were disappearing. I informed my friend that I had reached the end of the line but she went on for a short distance before turning around. While I sat on a rock and waited, I noticed some vegetation growing on another boulder nearby. 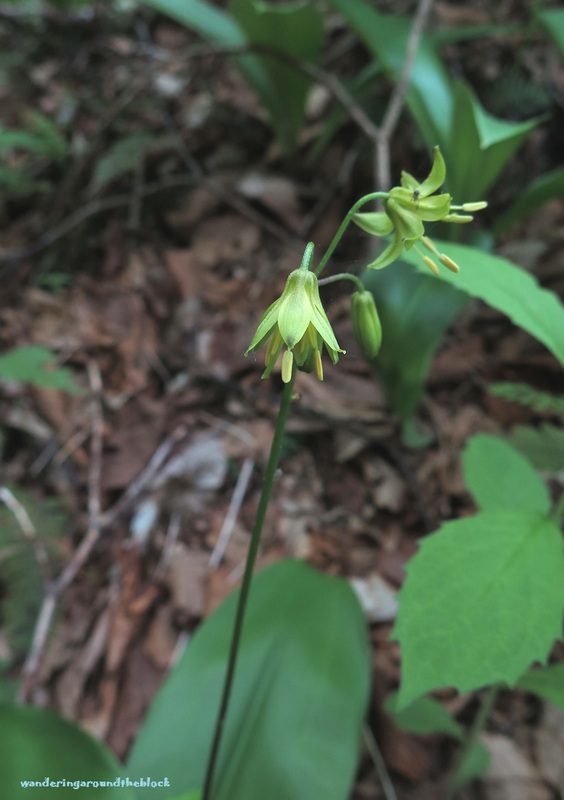 I went over to study the greenery, able to determine that there was definitely some kind of lily in the greenery. I later identified this as a Blue-bead Lily. Once again, two kindred spirits took some time practicing photographing the flowers before heading back down the trail. Our round-trip adventure was a little under 3 hours. After our short visit to the Charlotte Rhoades Butterfly Garden, we headed towards Beech Mountain and the Beech Mountain Loop trail. 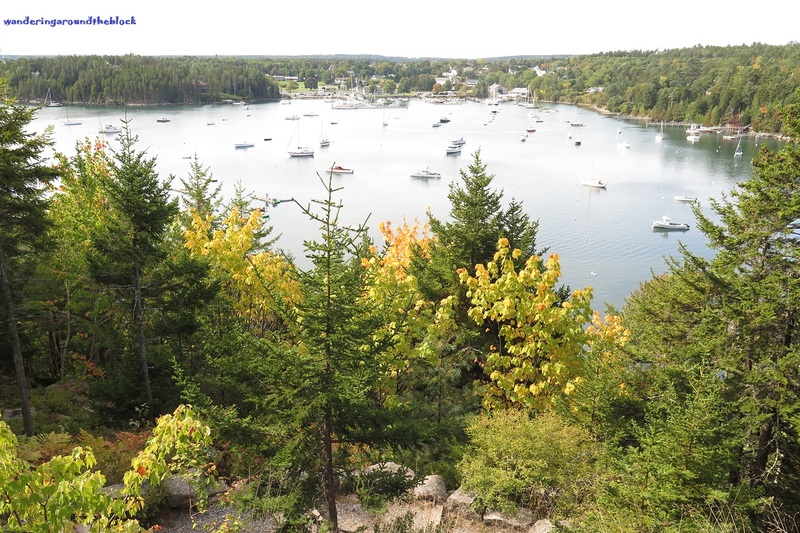 When planning our trip to the Southwest Harbor side of Acadia, I had researched several hiking options in the area. Given all the rain in previous weeks, and consequently, our lack of getting out to exercise, I knew our endurance level would be low. There were a number of options that would take us to the top of Beech Mountain, but when I saw someone’s description of the “short-and-sweet Beech Mountain Loop” I knew I had found our trail. Arriving at the trail-head we opted to walk the loop in a counter clockwise direction, which would take us up the longer trail first. A short way into our hike, we stopped to examine the flowers hanging underneath the leaves of some unidentified tree. 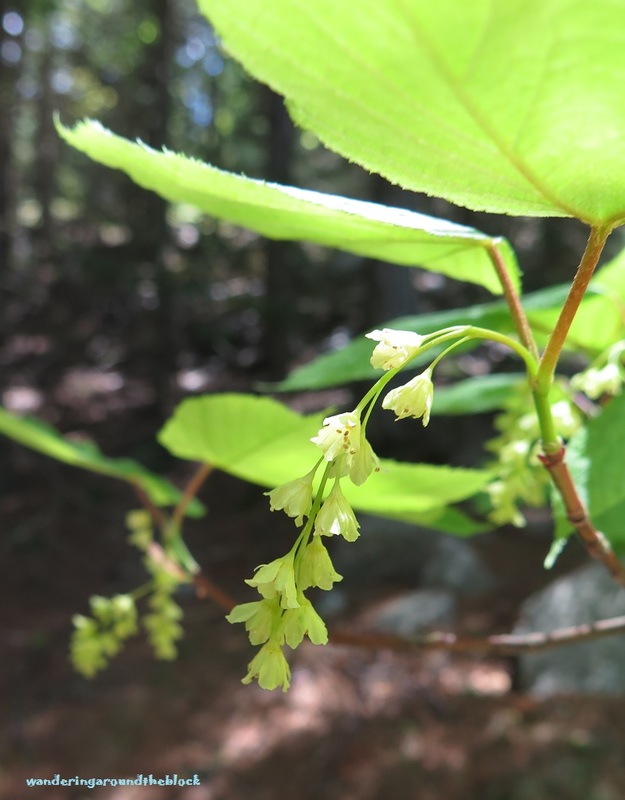 I researched this flower after our trip and I believe the tree was a young striped maple. 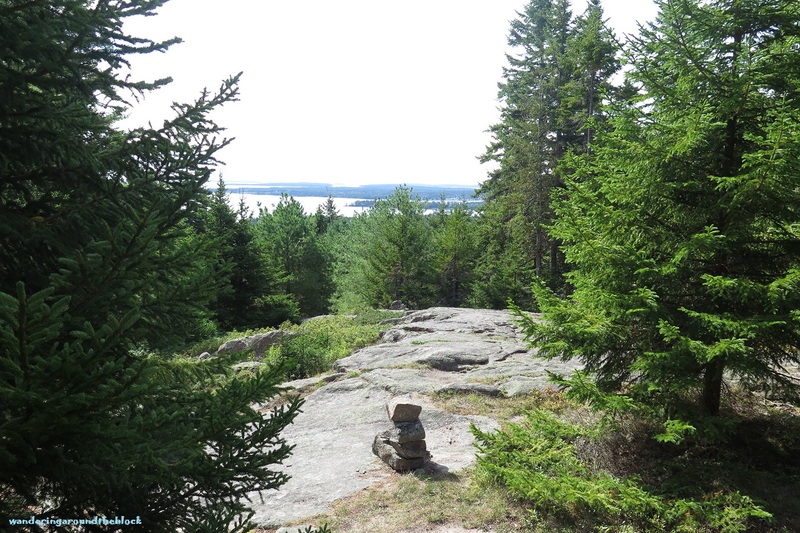 In between the typical granite composition of the Mount Desert Island trails, there were some areas that were a bit muddy, but nothing that we couldn’t handle. The black flies were still around as well. I did not really notice the flies until I discovered a large bite later on. Despite all this, the day was sunny and it just felt good to be outside. 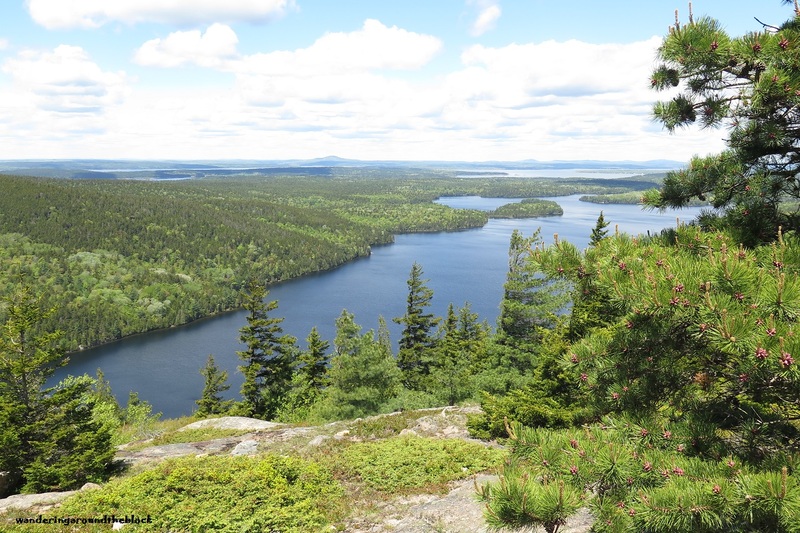 As we made our way up the path, the forest thinned out and allowed us some wonderful views of Long Pond. I believe I photographed this pond several times during our ascent. 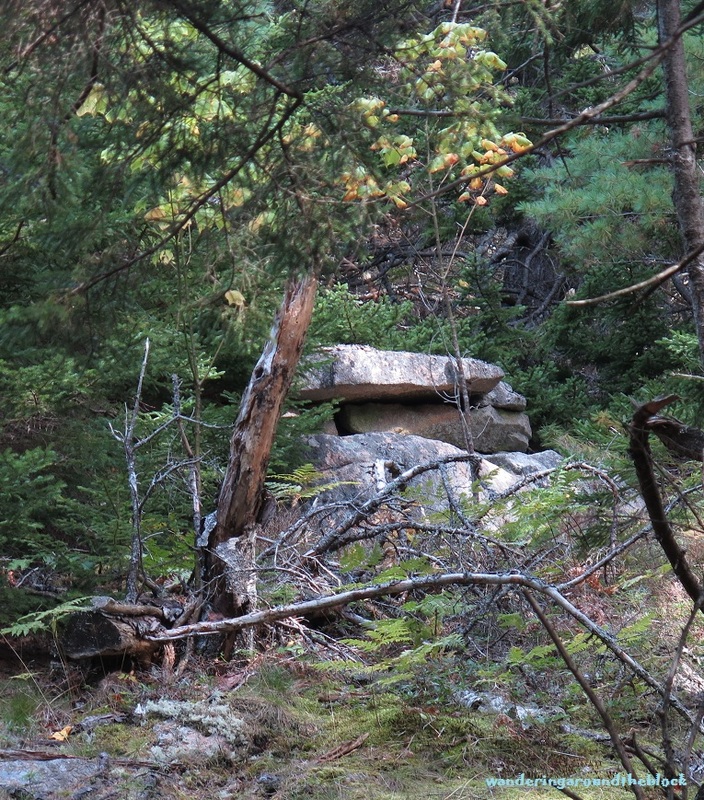 Soon the trees gave way to granite ledge, giving us a clear view of Long Pond. Following the trail around the ledge, we re-entered the forest for a bit. Here we found an old structure that had the appearance of an outhouse, now locked and decommissioned. Pretty soon, we ascended a short flight of stone steps which deposited us just beneath the summit. We scrambled up the last section to the top of Beech Mountain and the base of an old fire tower. There was plenty of ledge for us to sit and rest a bit while we enjoyed the views of the Cranberry Islands and our snack. After our snack, we decided to continue on the loop rather than return on the same section of trail we had just completed. 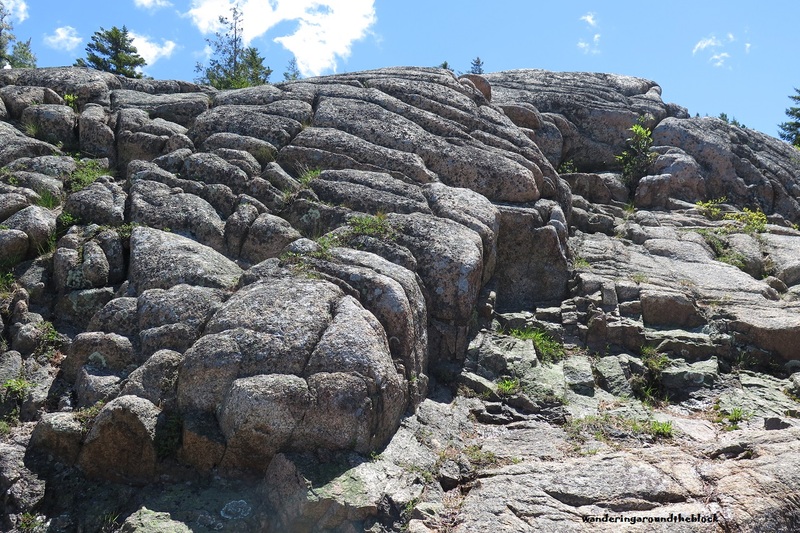 This side of the loop was a bit more challenging, with a more rocky portions to scramble down. In a few places that required a long stretch, I used the sit and slide approach to make my way down to the next rock. My philosophy has always been that there are times when it does not pay to try and appear graceful. This was one of them. Since this was the shorter section of the loop, it wasn’t long before we had completed the loop. A few more feet and we were back at the parking lot. The clouds were beginning to return, so we called it a day and stopped for lunch before heading home. After lunch, we examined our choices for one more hike before the end of the day. 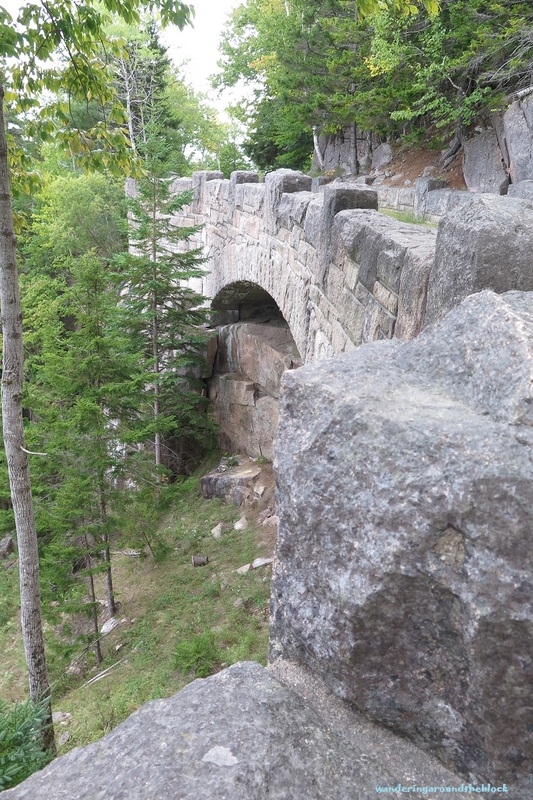 I thought it would be fitting to explore the Carriage Roads in honor of the 100th anniversary of Acadia National Park. 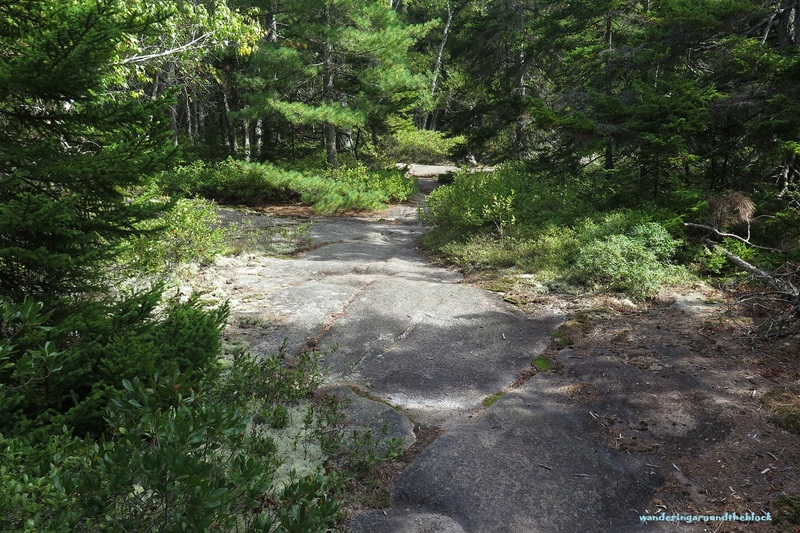 There is an excellent book called “Carriage Roads of Acadia National Park” that gives detailed directions describing 12 loops ranging from a little over 1 mile to 11 miles. I examined this little gem and decided we could accomplish the Jordon Stream loop which was about 4 miles. 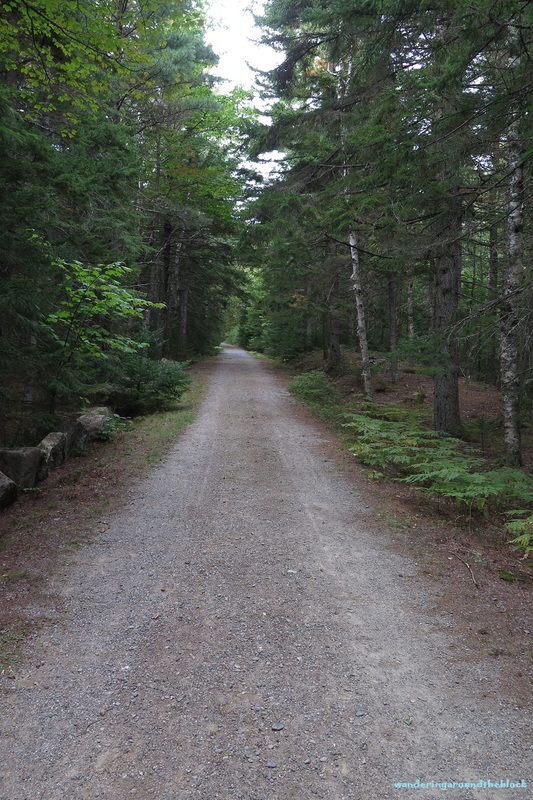 I also persuaded my husband that the Carriage Roads would not be that strenuous because they were relatively flat. Boy would those words come back to haunt me. We parked at the Jordon Pond parking area and proceeded to walk past the overcrowded Jordon Pond Teahouse parking area towards the Gate House and the beginning of our adventure. At the first signpost, the road crossed over a stream. 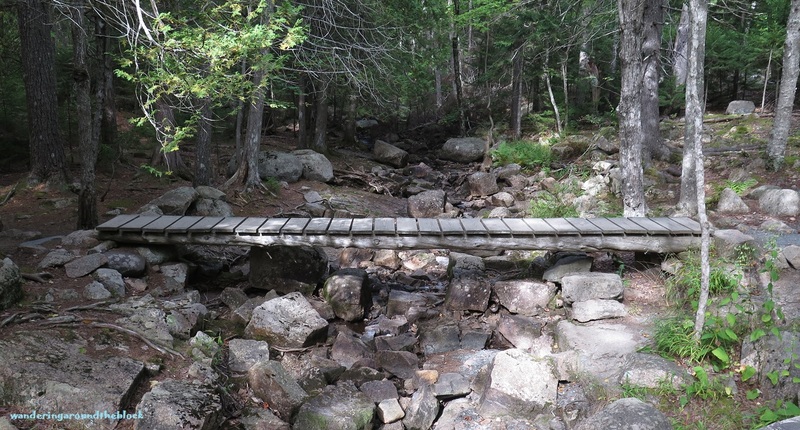 Not for from the road, a planked bridge crossed Jordan Stream. This allowed the more adventurous hikers to follow the Jordan Stream Trail (not to be confused with the Carriage Road). On one side of the road, Jordon Stream trickled below us, as we proceeded uphill. This is where I disagreed with the book that describes a “downhill run”. It was nothing of the sort. In fact, by the end of 4 miles I don’t know how many times I heard my husband murmur that “it will be easy, she said. Carriage roads are flat, she said”. I do have to say that neither one of us has ever walked a loop that seemed to go uphill its entire length. But, maybe we were delusional after 2 hours. At post 24, we turned right, crossing the Cobblestone Bridge. We studied the bridge for a bit and watched the stream flowing underneath before moving on. Soon after, the trees thinned out and we had an excellent view looking out over water (Little Long Pond perhaps?). We continued our climb, but at some point we had to sit on the stones lining the road to catch our breath. As two cyclists passed us, one commented that “the only way we were going to catch up to you is if you stopped”. So yes, the road still went uphill. Ironically, once we continued our journey, we discovered we were not far from the next turn that would take us back towards Jordan Pond. At this point, we had gone 2.7 miles. By the time we reached Cliffside Bridge we were both pretty tired but we still had a mile to go, so we stopped to take in the views. 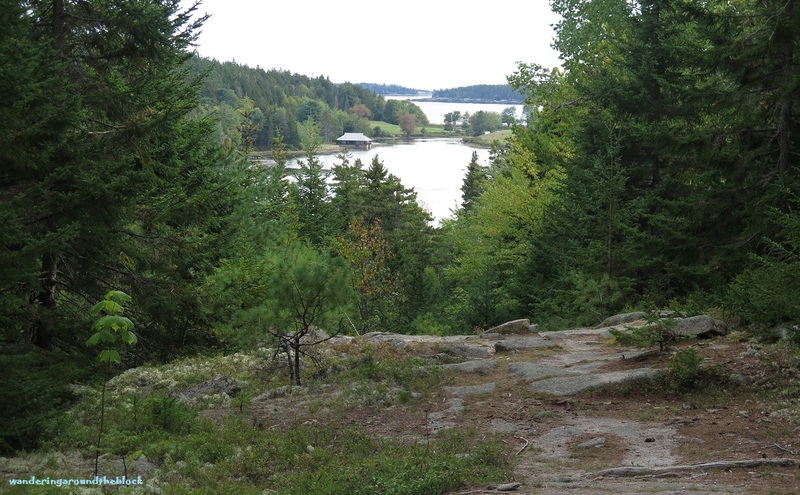 The downside of my little Carriage Roads book was that it was written 20 years ago, so “the wonderful views of Jordan Pond House and Little Long Pond” were no longer visible. Within another 20 minutes we were back at Jordan Pond and ready to call it a day. After enjoying the morning exploring the gardens near Northeast Harbor, we walked through the gate at Thuya Gardens to ascend Eliot Mountain. Once through the garden portal, we left the well maintained walkways behind us and began walking along one of the rocky trails so familiar to Mt. Desert Island. At the next intersection we faced an interesting dilemma. We knew that we wanted to get to the Eliot Mountain Trail but the signpost here pointed one way towards the parking area and another way for “The Richard Trail”, which appeared to be a relatively new post. This unknown road was not on any of our trail maps, and we knew we didn’t want to end back at the entrance, so with a leap of faith, we headed along the Richard Trail. Later, I discovered that this new trail, connecting Thuya Garden to the western carriage road on the Little Long Pond lands was constructed this past year to honor the late Richard Rockefeller. Soon enough, we came to another marker that indicated the Richard Trail continued straight across the Eliot Trail towards the carriage road. Fortunately, the marker here indicated that we needed to turn left in order to reach the summit. Confident now of our direction, we began the short ascent towards Eliot Mountain. 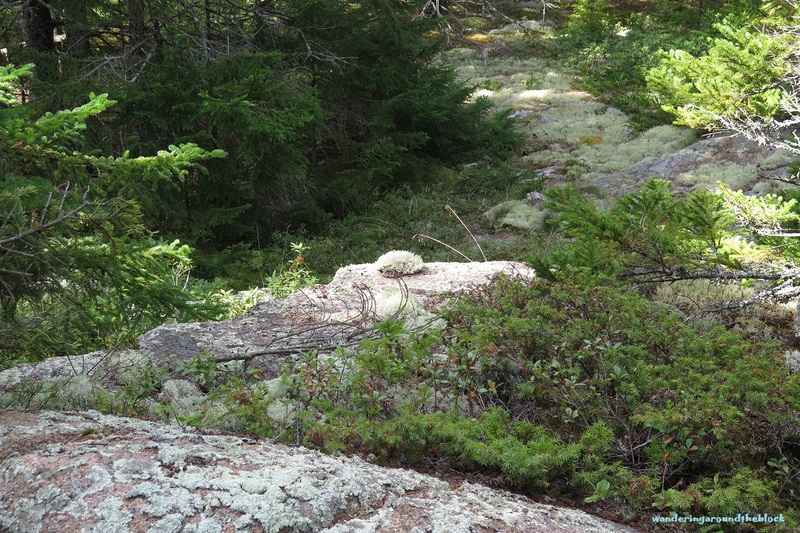 As we made our ascent, I discovered an interesting stone formation in the woods to our right. Lately I’m in tune with finding images in different objects, so I was not surprised that I could make out a face in this rock outcropping. I could clearly see a nose and a mouth but I’m not sure what the flat object covering its eye could be. Must be why it looked so grumpy. It wasn’t long before we reached the summit of Eliot Mountain. There we found a bronze plaque honoring Charles Eliot. We also located 2 summit survey markers, designating not Eliot but Savage Mountain. My husband did find some reference to various name changes that took place within Acadia over the years, so I guess at some point this peak was known as Savage Mountain. We stayed for a while studying the markers, the monument and a single stalk of golden rod that seemed to grow out of the rock, before making our way back towards Thuya Garden. As we turned back down the trail we were surprised by a wonderful view of the harbor. This view was a gift and a reminder that sometimes we have to look all around us to find such gems. We admired the view for a bit before heading off to find lunch. The next stop during our Mt. 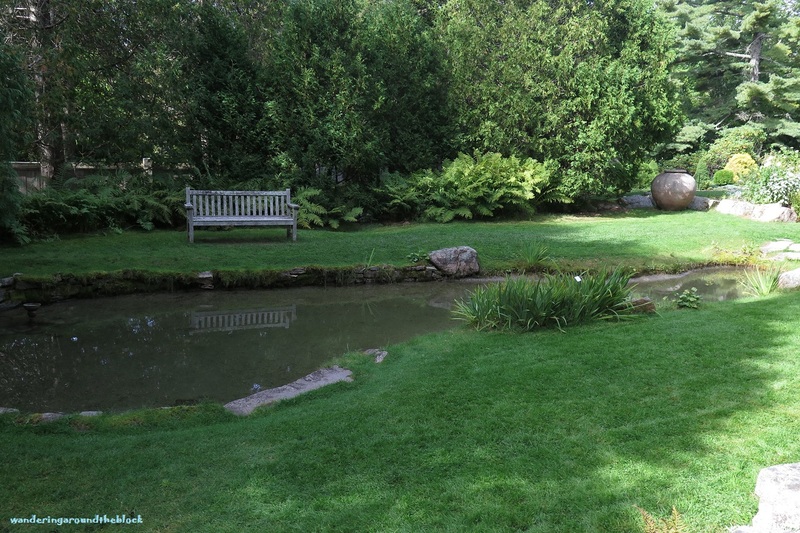 Desert Island visit was Thuya Garden, only ¼ to ½ mile from Asticou Gardens. Our brochure described a loop that hikers could use to travel between the two but since I misinterpreted the duration of that walk, we opted to begin our exploration from the lower parking area for Thuya Garden. From the parking area, visitors must cross Route 3 (please use caution in using the crosswalk) towards the Asticou Terraces trailhead. 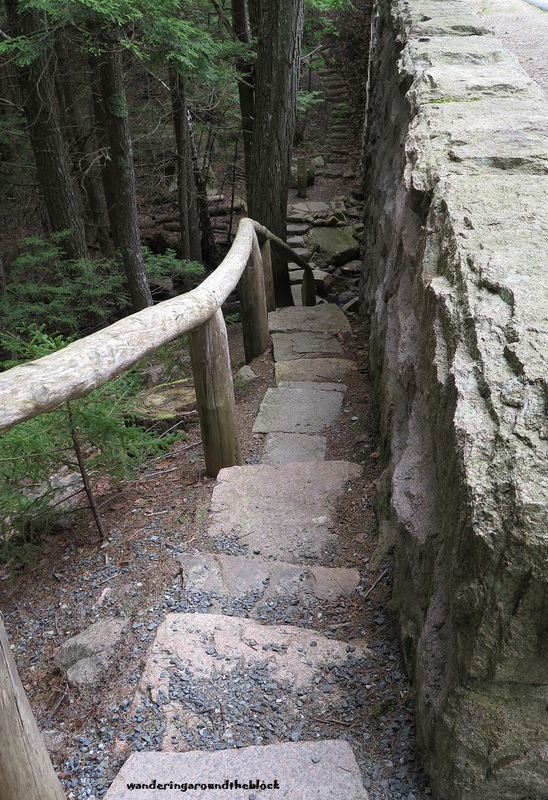 The Terraces Trail designed and built by Joseph Henry Curtis around 1912 is an uphill journey of paths and granite steps. 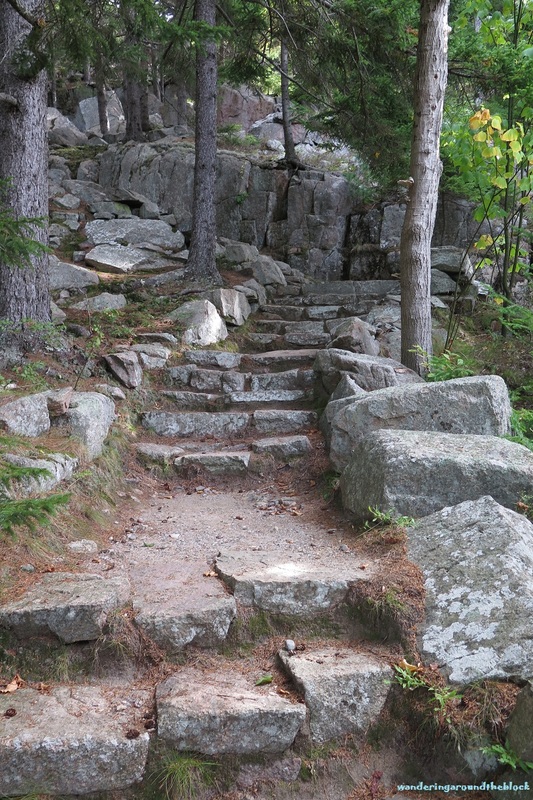 Our excursion began by climbing a series of granite steps, followed by the trail curving back and forth along the slope. As we made our ascent around each loop, we found sheltered huts looking out over Northeast Harbor. Each shelter was of a different design and each offered its own unique seating arrangements for the explorer to pause and enjoy the harbor views. 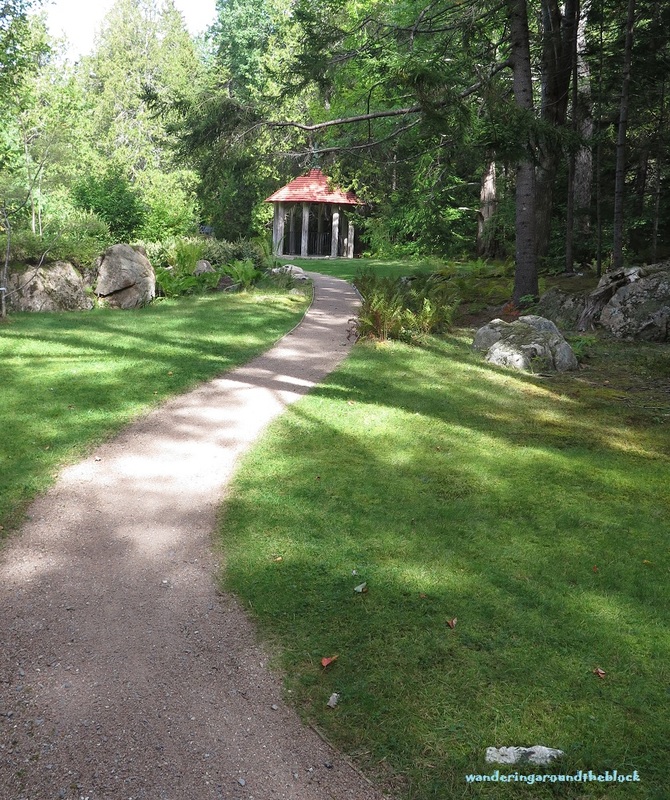 At the top of the hill, a well maintained path surrounded by low bushes, spruce and cedar trees took us past Thuya Lodge towards the garden gates. I had visited Thuya Gardens many years before and I could still remember how impressed I was by those gates. Designed by Charles Savage these doors were hand carved in cedar with each door displaying 24 natural history images. The carvings of those images were perfect, right down to the pileated woodpecker holes in a tree. Like the Asticou Gardens, Thuya was also designed by Charles Savage and it was interesting to note the differences between the two. Asticou surrounded the visitor with the meditative peace of a Japanese garden while Thuya presented the disciplined structure of a formal English garden, its large expansive lawn bordered by flower beds inviting a different kind of contemplative study. Once again, we noted each plant label for future reference and then promptly forgot it. We worked our way towards the far end of the garden, where a pavilion allowed visitors to look down the length of the garden. Nearby, we found a gate that indicated it was the trail towards Asticou Gardens. 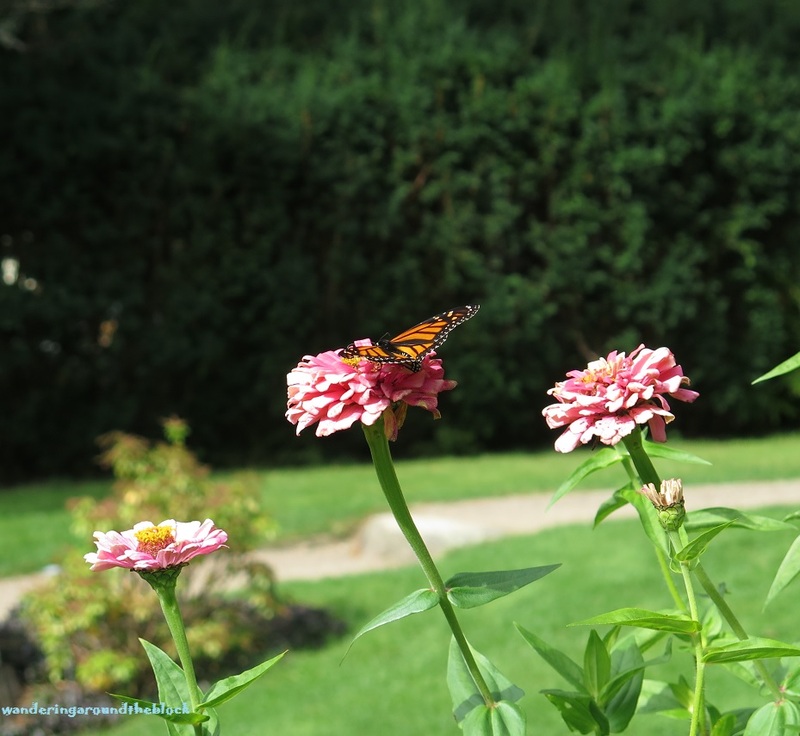 From the pavilion we continued down the next row of flower beds before, pausing briefly to watch a Monarch butterfly flit among the flowers. Nearby we discovered a section of vegetation described as a Monarch hatchery. There were signs warning visitors not to disturb the chrysalises, so we strolled carefully through the area hoping to spot some evidence of a butterfly waiting to emerge. Since it was the beginning of October and we did not find any chrysalis, we assumed that all the butterflies had already dispersed for the season. From the butterfly hatchery, we continued our exploration back towards the entrance. We paused to study an interesting spring house not far from a gate pointing the way to the Eliot Mountain Trail. We admired a nearby reflecting pool before heading through the gate.